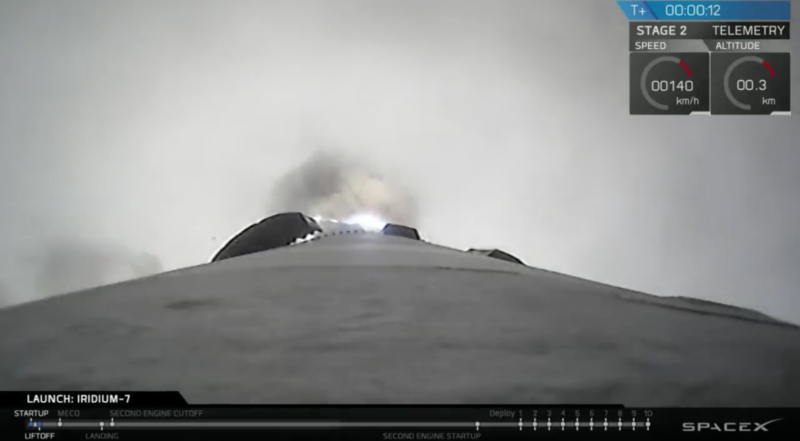 WASHINGTON — SpaceX launched 10 Iridium Next telecom satellites July 25 on a Falcon 9 rocket, bringing Iridium’s constellation one launch away from completion. SpaceX has made four attempts with “Mr Steven” and has added parachutes to payload fairings to slow their descent, but no captures have succeeded to date. SpaceX said it will continue attempting to recover the fairings, which cost around $6 million to make, according to the company. McLean, Virginia-based Iridium now has 65 second-generation Iridium Next satellites in orbit. A final launch, also of 10 satellites on a Falcon 9, will complete the constellation, replacing the first-generation system that has been operating since the late 1990s. The $3 billion Iridium Next constellation carries more powerful L-band payloads capable of providing up to 1.4 Mbps of connectivity to boats, planes and various satellite-connected devices. The cross-linked network also carries three sets of hosted payloads for other operators: aircraft tracking sensors for Aireon, ship-tracking sensors for exactEarth and space weather sensors for the U.S. Defense Department. Once finished, Iridium Next will consist of 66 operational satellites, nine orbiting spares and six ground spares. European satellite manufacturer Thales Alenia Space is the prime contractor for the satellites, working with Northrop Grumman Innovation Systems to integrate the satellites in Gilbert, Arizona. The final Iridium Next launch is expected “later this year” at Vandenberg, according to SpaceX’s launch narrator.